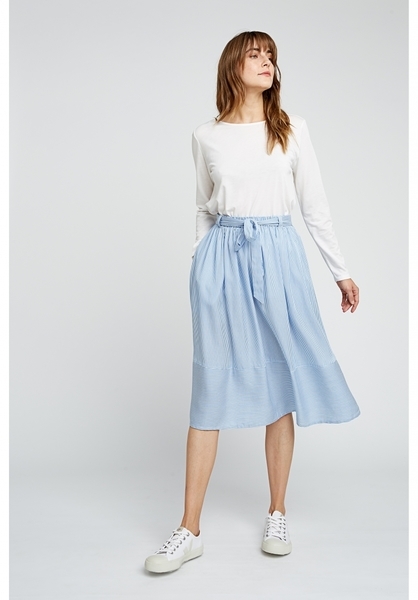 Pinstripe sky-blue and white lightweight below-the-knee skirt. Elasticated waist with fabric tie belt in same fabric. 100% Tencel makes is super soft and lightweight. Wash on a low spin with mild detergent. This fabric is made from TENCEL branded Lyocell fibres. These are cellulose fibres made from wood pulp. The fibre production itself is extremely eco-friendly due to the closed loop manufacturing process used. This means that almost 100% of the solvent used in production is recycled. Tencel Lyocell fibres have a super soft touch and are gentle on the skin. Creative Handicrafts was founded in 1984. This dynamic fair-trade organisation helps low income women achieve economic independence by training and creating jobs. Today they support 750 families in the slums of Mumbai with a livelihood programme, sponsorship of children's education and a micro-credit scheme.